The new Vitrek V5 Electrical Safety Analyser from Westek Electronics combines AC and DC dielectric strength testing, insulation resistance testing, leakage current and high current ground bond testing in accordance with UL, CSA, IEC and TUV standards. The Vitrek V5 Electrical Safety Analyser can be used as an analytical tool in engineering and development, or in a production environment and is highly suited to multi-point measurement by virtue of its inbuilt 8-point scanner. A bi-directional RS 232 port permits automation of testing procedures and an optional GP-IB port (talker/listener) is also available. Dielectric strength can be measured to 5 kV AC with a maximum current of 40 mA, and to 6 kV DC with a maximum current of 10 mA. Insulation resistance can be measured to 10 Giga-Ohm at voltages to a 1000 Volts. Ground bond testing takes place with a maximum current of 42 Amps and a maximum resistance of 600 Milli-Ohm. 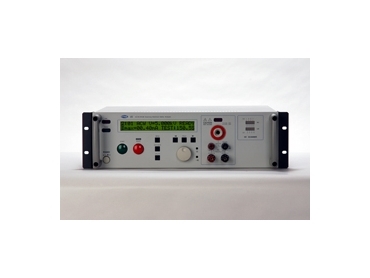 The Vitrek V5 Series Electrical Safety Analyser incorporates 10 programming sequences of 16 steps maximum per sequence including digital ramp and dwell times, and a Safety fault Interrupt Circuit.